In 1969, despite the best efforts of its cast, crew and unrelenting fanbase, the original Star Trek television series was cancelled by NBC after 79 episodes due to supposedly poor ratings. 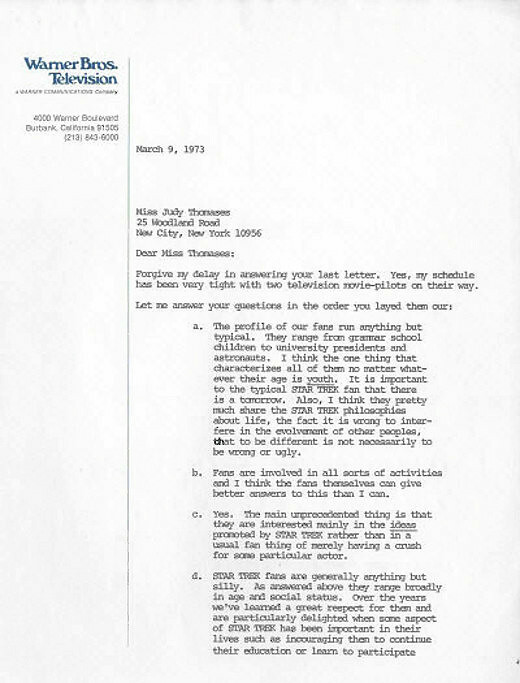 In the following letter, written in 1973 to a lady named Judy Thomases, the show's creator - Gene Roddenberry - praises the show's fans, admits to giving Spock a 'slight look of the devil' in order to please the show's female audience, and speaks of his desire to see the show revived. A fascinating read. A scan of the first page can be seen below, followed by a transcript of the entire letter. Forgive my delay in answering your last letter. Yes, my schedule has been very tight with two television movie-pilots on their way. a. The profile of our fans run anything but typical. They range from grammar school children to university presidents and astronauts. I think the one thing that characterizes all of them no matter whatever their age is youth. It is important to the typical STAR TREK fan that there is a tomorrow. Also, I think they pretty much share the STAR TREK philosophies about life, the fact it is wrong to interfere in the evolvement of other peoples, that to be different is not necessarily to be wrong or ugly. b. Fans are involved in all sorts of activities and I think the fans themselves can give better answers to this than I can. c. Yes. The main unprecedented thing is that they are interested mainly in the ideas promoted by STAR TREK rather than in a usual fan thing of merely having a crush for some particular actor. f. Answered above. They are interested in ideas in the show, and what it tries to say. g. STAR TREK says that it has not all happened, it has not all been discovered, that tomorrow can be as challenging and adventurous as any time man has ever lived. I think also it is interesting that STAR TREK came along at a time that the nation was becoming deeply involved in Vietnam and STAR TREK very strongly spoke against this by dramatically illustrating why it is wrong to interfere with other people, why other cultures can be equal and better to leave alone, why it is wrong to kill for any reason what-so-ever. h. Yes. We did think Spock became very interesting to fans, I did purposely give him a slight look of the 'devil' because I thought that might be particularly provocative to women, particularly when his nature contrasted so greatly to this. I'll take credit for formulating Spock and guiding the character, then give as much credit to Leonard Nimoy for making it work, and also credit to the writers who kept it going in many story situations. a. I think I've given STAR TREK'S main message above. b. It did not have a sufficiently high audience rating in regards numbers of people. Later when they went to another demographic system of rating audience by its purchasing power they discovered that STAR TREK was much superior to most other shows. This, obviously, is important in commerical television where the whole point of the thing is to reach people who can buy the products that are advertised. However, by the time they began measuring under that system the following year, STAR TREK had already been cancelled. If STAR TREK were on the air today with the same demographics, it would stay on the air as most shows are now trying to achieve STAR TREK'S audience profile which is considered rather ideal. c. I withdrew from the show during the 3rd year in an effort to force NBC to give us a better time slot and better treatment. d. STAR TREK had no 'magic formula' unless you consider respect for the audience and hard work a formula. It has been my opinion for years that science fiction, like any other story, should be mainly about people with hardware being secondary. It seems to me the networks and stations have wasted a lot of money seeking some mysterious formula in STAR TREK when really you make your science fiction the same way you make any other good story and there are no shortcuts. e. I would love to see STAR TREK revived under the proper conditions. All of us who worked on the show have a great affection for it. However, I am only a partial owner of STAR TREK which is also owned by Paramount and NBC. Paramount owns the copyright to it and the ultimate decision is really in their lap. They refer to their existing STAR TREK episodes being re-run as their "79 Jewels" and of course they think twice before putting a new one on if it would destroy the value of the ones they already have. I don't think it would, but this so far has been fear of their business people.